“ Although I am somewhat of a homebody and love to be in my place with my people, home is truly anywhere to me that I feel comfortable taking my shoes off and grabbing a blanket, and covering up on the couch and spending time with those I love most. That’s mostly been places with family and close friends, and it’s in that time and space where I can simply enjoy the company of who I’m with and feel relaxed and happy. Marrying a man who has a son from a previous marriage has been one of the most challenging and rewarding things that I did not plan for myself initially. I’ve had to figure out how to incorporate myself into an existing family and then grow and nurture a new family from that. It’s been comforting to have a partner who I know is already such an amazing dad as we bring in a new addition in May with a soon-to-be baby girl. It will be a new adventure for all of us that I’m excited to play out! 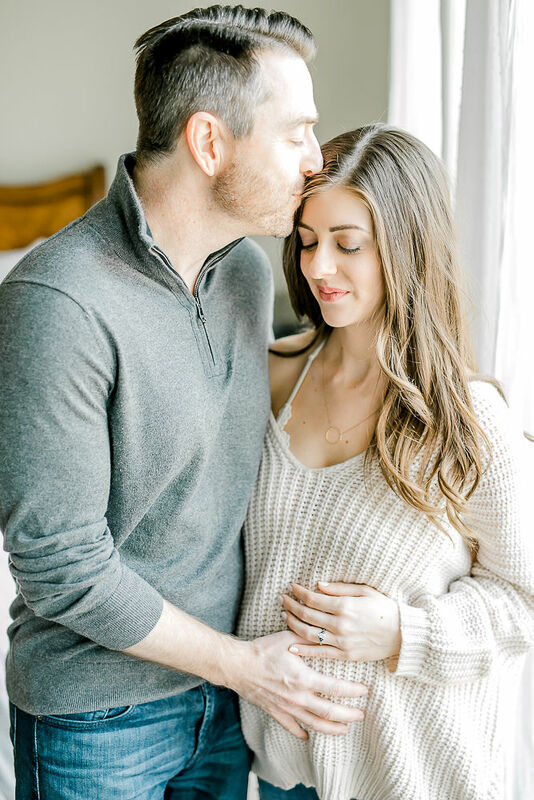 My pregnancy has been a very trying and challenging one and my husband has gone above and beyond to ensure my comfort and sanity through it all. The only thing that has seemed to soothe the times of extreme stress and pain has been warm baths. Because of this, he has made multiple surprise trips to Bath & Body Works to buy essential oil bath bombs. I didn’t even know he knew where that place was! After hard days, I’ve come home to a warm bath drawn for me with calming scents and a cozy robe. It’s the combination of his selfless love and a really incredible smelling bath bomb that has genuinely helped me through this pregnancy. My favorite part of my home is our bedroom. I can let the whole house be a kid zone or a work space or a dog kennel but the bedroom is always my calm and happy place. I’ve purposely kept it white and neutral colors with minimal decor and some really great lemongrass or lavender essential oils to provide much needed zen. I love rainy afternoons where I can just take a nap with the hubby or read or, let’s be real, scroll through countless Instagram posts while laying on my bed and not realizing how half an hour has already passed. However I choose to spend my time in my room is sacred and most importantly it’s a place that my husband and I share together to pillow talk and cuddle and do other fun married things! There are so many dynamics of our blended family that she will add to. For one, my step son has always wanted a sibling. Although he may tell you when he hoped for this he had a little brother in mind, he is so very happy to be a big brother and I can't wait for them to have the inevitable bond they will share together. It worried me for a while that their 10 year age gap would keep them from sharing some of the special ties of being a sibling and they would hardly have a connection or cross paths, being in such different places in life. I've had many friends tell me of their similar situations with siblings of all backgrounds and I'm assured that although theirs will be different than how mine and my sisters was, or my husband and his brothers was, that they will have this special love that can only come with their unique dynamic. She will think he hung the moon and he will have this forever shadow that I know he will adore and help to mold and teach. She completes the love and union my husband and I share. If I'm being brutally honest, it was a hard thought for me to not have a bond with him that he had with someone else as he parents with his son's mom. Step parents may know this struggle and guilt fills me for having these feelings, as I know how strong our love is, but it's important to me to be able to understand this love he has for another human and the many "I told you so's" I'll have coming my way from him as a response to our past disagreements on parenting. I'm actually so grateful for his knowledge and experience and I prayed so much for a little girl so we could experience a new type of parenting journey together, and I certainly was right! He is very out of his element with the bows and girly stuff, and it's been such a fun thing for me to get to still have those first time(ish) parent feels with him.